For tourists looking to discover the pristine landscapes of the Kingdom of Lesotho and business people seeking investment opportunities in Southern Africa, the Government of Lesotho has facilitated it’s visa process. With the launch of Lesotho's E-Visa application platform, your visa is just 72-hours away! Applicants are no longer required to schedule appointments at the Kingdom of Lesotho’s embassies and consulates to obtain a visa. The first step to apply for a Tourist e-Visa is to fill out an easy online application. Once you have electronically submitted your application, you will receive the confirmation by email. Please take care to answer all questions on the application accurately and completely. Names must be the same, family or birth certificates must be supplied. The validity of your visa depends on immigration authorities and maximum length of stay is 30 days. Your travel document has to be valid for a minimum of 6 months beyond your intended period of stay. It is highly recommended that visa applications be lodged at least 3 weeks before the estimated date of departure and not more than 12 months before that date. What is the Lesotho Tourist eVisa? The Lesotho Tourist eVisa is the official travel document needed by foreigners wishing to enter the Kingdom of Lesotho in a business, tourism or schooling visit. What do I need to apply for a Lesotho Tourist eVisa? NOTE: IF you are traveling with a minor aged 16 and below, you must provide the following: Names must be the same, family or birth certificates must be supplied. What is the cost to obtain a Lesoto Tourist eVisa? How long does it take to get a Lesotho Tourist eVisa? What requirements should my passport meet if I want to apply for a Lesotho Tourist eVisa? How long can I stay in Lesotho with an e-Visa? How many entries are allowed under a Lesotho Tourist eVisa? The Lesotho Tourist eVisa allows for a single entry. Can I work under a Lesotho Tourist eVisa? NO, work or any paid activity is prohibited under an Lesotho Tourist eVisa. Which countries are exempt of a Lesotho Tourist eVisa? To stay up to 90 days: Antigua and Barbuda, Bahamas, Barbados, Belize, Brunei, Dominica, Gambia, Grenada, Guyana, Hong Kong, Ireland, Israel, Jamaica, Japan, Kenya, Kiribati, Malawi, Malaysia, Maldives, Mauritius, Namibia, Nauru, Papua New Guinea, Saint Kitts and Nevis, Saint Lucia, Saint Vincent and the Grenadines, Samoa, San Marino, Seychelles, Sierra Leone, Singapore, Solomon Islands, Trinidad and Tobago, Tuvalu, Uganda, Vanuatu, Zambia, Tanzania, Tonga. Does a Tourist e-Visa guarantee entry to Lesotho? NO, holding a visa does not guarantee you entry into Lesotho. What happens if my visa expires while I am still in Lesotho? 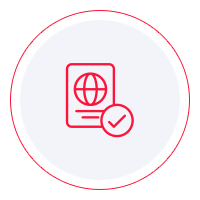 You will be required to reapply for an emergency visa at the border or airport.